Sugar Candy Comfort Bra for Fuller Busts–How Sweet It Is! Darlene, I want to clarify that Sugar Candy was not created to replace the typical wire, fuller bust bra which is much needed. Sugar Candy is purely a comfort bra option, that women can wear at home and to bed. Well, then! 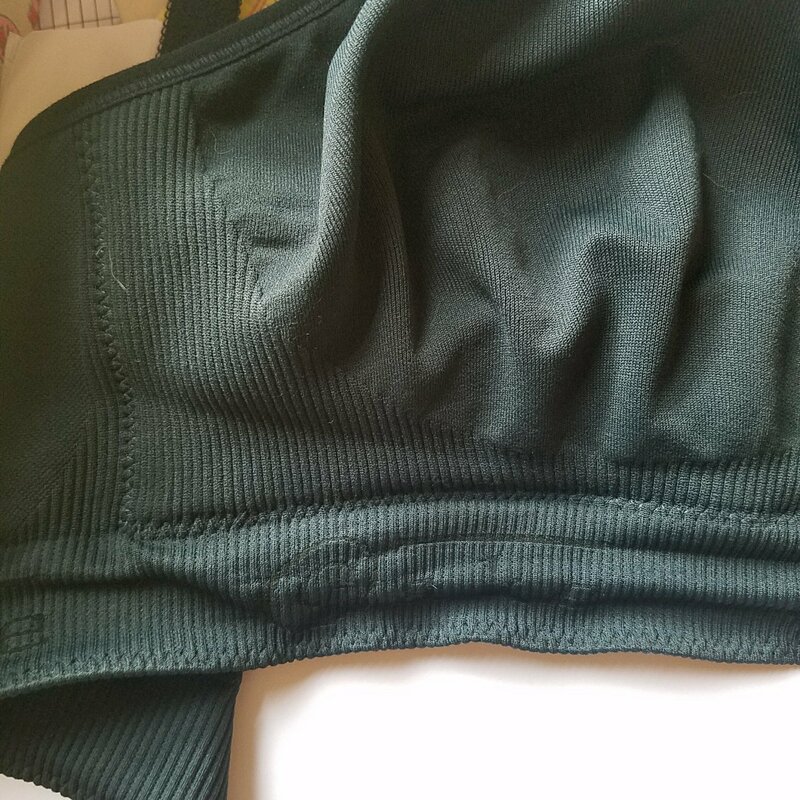 I replied with a request for samples, and the company sent me a medium and Leah an XS and S. We used the UK columns and rows in their size chart, and since I’m somewhere in the 34FF/G range right now, it was refreshing that M covered all my options. 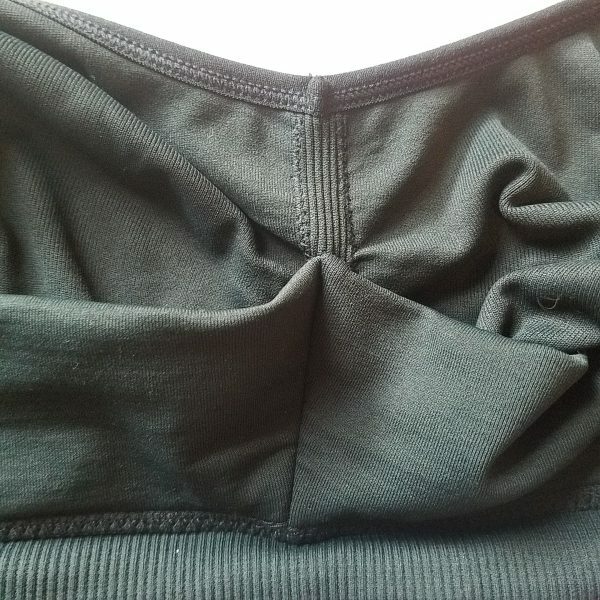 Underwires have been uncomfortable for me lately–probably because of my delay to buy new bras after my 10 pound weight gain–so I was counting the days until my UPS package arrived. 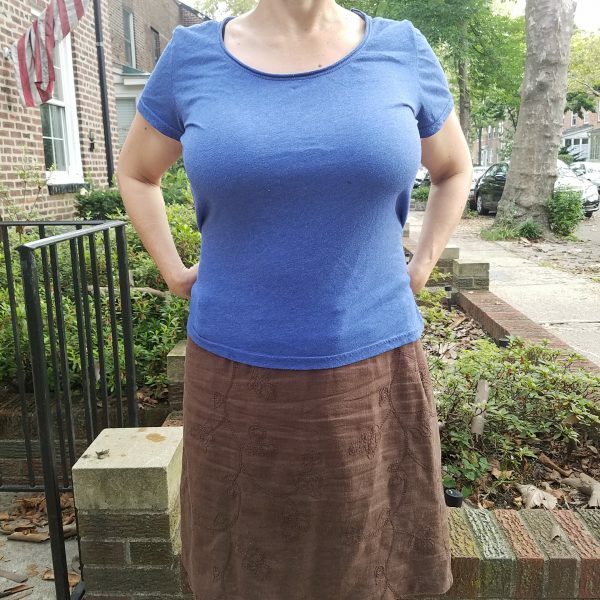 When I opened the box, I was surprised at how hefty the bra felt due to “a series of internalised supports, stabilisers, straps & differing tensions of knit to achieve the shape, support & bust projection that’s typically expected of a fuller bust bra”. As I wear it, the horizontal slings sometimes feel like they bunch up a bit, but when I reach in to check things out, the slings are still in place, so I’m not sure where that’s coming from. You can also see the folds in the ribbed knitting of the band below. On the other hand, note the same strong ribbed fabric framing the cups. The layers and differing tensions work wonders because this bra passes the walk down stairs test with flying colors. I don’t have to hold my chest with my hands. Instead, the slings feel like bungee cords firmly “boinging” my breasts back up to where they belong! 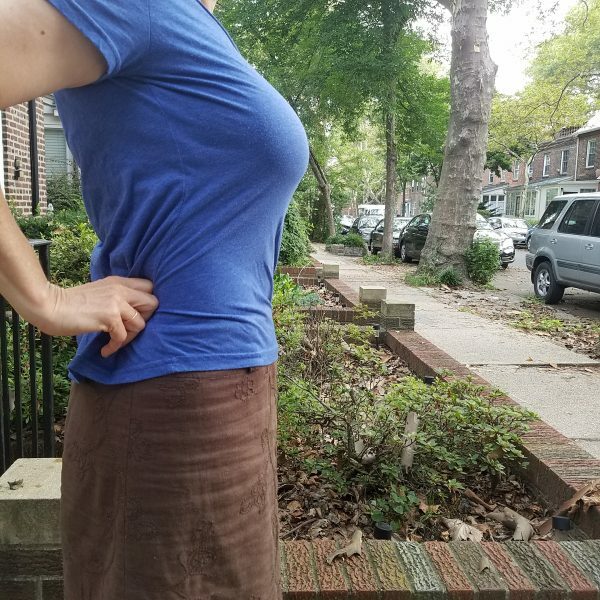 Here’s another surprise: on this third day of wear, my breasts are actually separated. It’s a good thing I didn’t write about this bra after my first evening of wear because my breasts were definitely kissing each other then. At that time, I thought, “What can you do?” Now I’m amazed at all they’ve accomplished without any sense of being bound into a compression bra. Right off, I really liked the six columns of 3 hooks, and I’m still wearing this bra on the loosest hook on my third day of wearing it. 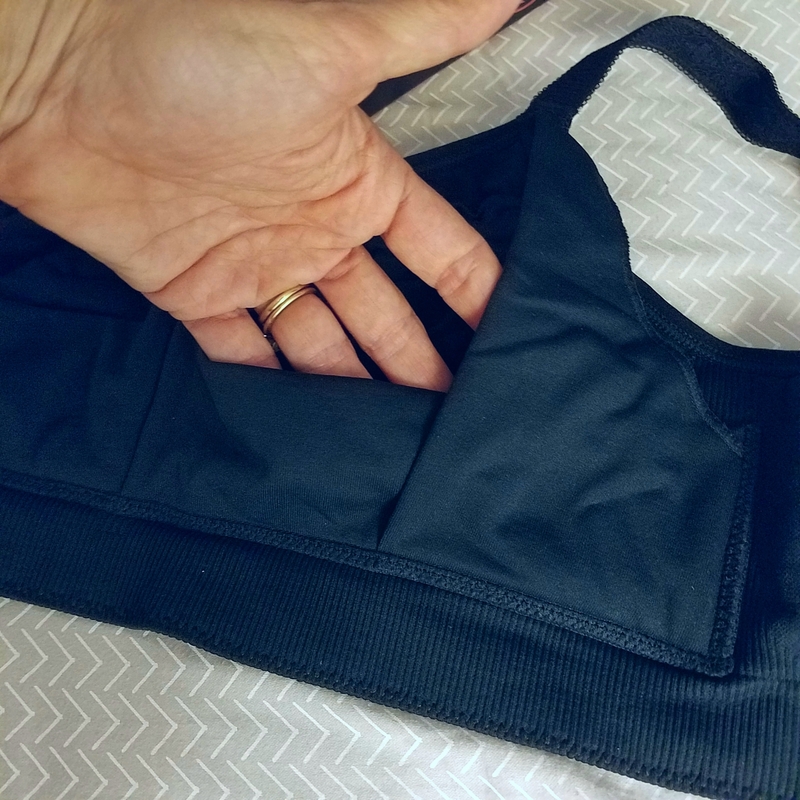 Initially, my profile was what I would expect from a wireless comfort bra–disappointing. However, as I’ve continued to wear it, I seem to be getting more of a natural look (but not too BreastNest natural!) as it conforms to my shape. I much prefer the water balloon profile of the seamless Sugar Candy to the beak-like profile of the seamed Nikol Djumon I wrote about a few weeks ago. This bra is already available in stores in the United States, including Levana Bratique, which also carries Ewa Michalak that I’m finally going to try when I have my C&K pop up shop there this weekend. You’ll be reading more about my experience soon, and you’ll be reading about Leah’s experience with Sugar Candy tomorrow! Ready to try Sugar Candy? We’d love it if you’d use our affiliate link to do so. All opinions in this post are my own, however. July 27, 2017 | Comments Off on Sugar Candy Comfort Bra for Fuller Busts–How Sweet It Is!